Richard Ridley is buried in St John the Baptist Church burial ground, Egglescliffe. Grave number 332598. The actual date of birth is not officially recorded, this tapestry embroidery sampler states it was February 15, 1808, date of death January 10, 1870. Richard Ridley calculated age at death was 61. On Richard Ridley gravestone the grave occupants including two infants, are listed below. I found this tapestry embroidery sampler in a junk shop in Leeds. I purchased it because of its Yarm and Stockton connection. 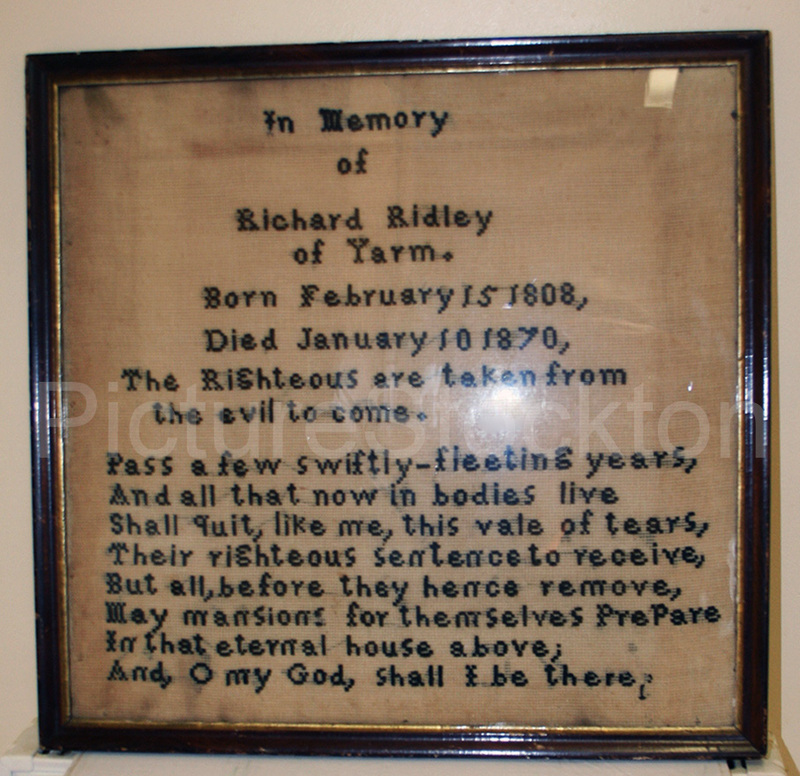 It appears to have been the custom then, in some denominations, Stockton 1870, to have a burial tapestry made to record a loved one’s memory and passing. I have traced the author of the prayer on it, to John Wesley, Editor-Poet-Priest, 1782, the Methodist Church founder, and horseback travelling famous Northern missionary. Image and details courtesy of Bob Wilson. Thank you Bob, well spotted and very interesting. Life has altered a bit since those days. Thank you for posting this image Bob. According to the 1861 Census, Richard Ridley was a Master Builder employing 8 men. At the time of the census he was living in Yarm with his wife and daughters, he must have moved to Egglescliffe at some later date.